Anyone who takes a look at my face knows that I’m a big fan of eye makeup. In fact, I frequently tell people that it is never too early for eyeliner. And, until now, nothing short of Pond’s Cold Cream (former pageant girls know what I’m talkin’ bout) could come close to the removal of said eye makeup. 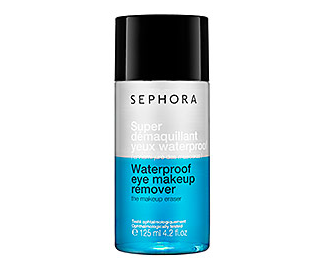 Enter Sephora’s Waterproof Eye Makeup Remover. To borrow a line from a co-worker of mine, this stuff is the dope jam. It removes every trace of makeup gently, and without having to use a ton of it (or cotton balls!). The $6.00 bottle would’ve lasted the late Tammy Faye Bakker at least a month – so for normal folks – it will get you through a year’s time.